Tilted Horizons: Happy Veterans Day! Off-topic, but a giant "Thank You!" to all U.S. vets and current service members from a former member of Unc' Sam's own Air Force. 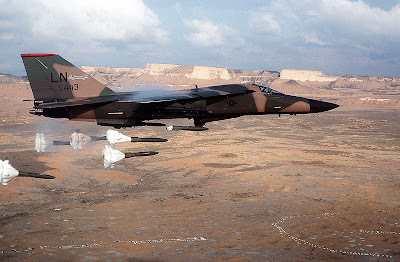 For anyone who cares: 431X1 ("Crew Chief" to you civilian types): F-111F, 48 TFW, 48 AGS, 493rd and 494th AMUs, RAF Lakenheath, UK 1982 - 1985; and F-111D & F, 57 FWW, 431 TES, McClellan AFB, Sacramento, CA 1985 - 1989. After separating, I did a year as a weekend warrior on C-130H with the 166th AW, Delaware ANG, 1990. An F-111F from one of my old squadrons (494th Black Panthers) dropping hi-drags in the Nevada desert. With a top speed exceeding Mach 2, it was just a little faster than a Suzuki Hayabusa -- almost as ugly, too.